Hi all, today we are launching a new feature / improvement to our stock music website www.Shockwave-Sound.com: The Super condensed view. Standard – shows a Play button for all versions of tracks, with prices, plus description. Condensed – shows only the main / full track version play button, and shows a bit of the description. Super Condensed – NEW! – shows only a big Play button and the track title. Does not show additional versions / edits, no description, no details. Here at Shockwave-Sound.com we are proud to unveil what we believe is the most powerful, most flexible and most useful royalty free music search engine anywhere. 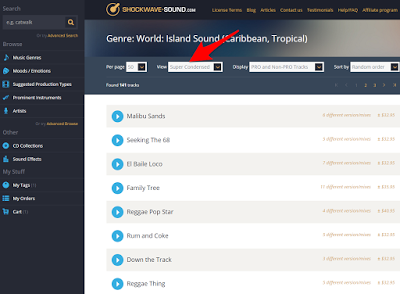 You can find the Advanced Browse by clicking the orange link in the left-hand menu of Shockwave-Sound.com, just below “Artists”. The Advanced Browse page allows you to combine multiple search / browse criteria such as Music Genre, Moods/Emotions, Prominent Instruments, Classical or Non-Classical, Tempo Feel, BPM Tempo Range, Length (in seconds) and more, to find tracks specifically matching your needs. The Advanced Browse page is also interconnected with the “Find Similar Tracks” function on our site. By clicking on “Find Similar Tracks” below any Track description, you are taken to the Advanced Browse page, which is then pre-filled for you, with multiple values from the track you were just listening to. Multiple operators are combined with either AND or OR values, and note that you can Click on any AND / OR button to swap it between working as AND or OR. Above, I have used the form to find Country/Bluegrass tracks that have either a Sad / Sorrowful / Mournful, or a “Gloomy / Dark / Sinister” mood. This gave me a result of 7 tracks, all are kind of sparse country track with a doom laden feel, highly suitable for things like historical drama, westerns / modern westerns and more. Note that if I wish, I could click on the OR button between the two Moods settings, to change it to an AND operator instead. In the above example I’ve quite simply found that my favorite artist is Dan Gautreau and I would like to browse all the Happy / Joyful / Positive tracks he has produced. This search result gave me 112 tracks, so I’ve got plenty of stuff to listen to. Since I felt that the 112 tracks I got from my previous browse results was “too much”, above I have added another criteria. This time I’ve gone for tracks by the artist Dan Gautreau, which are Happy / Joyful / Positive, and which features prominent use of Acoustic Piano. Now we’re getting more precise, and this browse gave me a result of 26 tracks. Above, I have decided to browse Vocal Pop tracks, which are either “Laidback / Easy-going / Chilled” OR “Happy / Joyful / Positive”, and are sung by a Male vocalist. This gave me a result of 128 tracks. If I wanted to, I could go back to the form and click on the OR button between the mood settings, and this would narrow the results to tracks that are both Laid back AND Happy – whilst still being in the Vocal Pop genre and being sung by a male vocalist. This would then give me 17 tracks. I’ve set the Music Genre setting to “Jazz: General & faster jazz” (I could change it to “Smooth jazz” if that’s what I wanted), and I’ve selected Piano (Acoustic) AND Drums (Drum kit) AND Bass (Upright/Acoustic). Hit “Search” and I find 119 tracks. Nice result! In the above case, I’ve decided to browse tracks in the Rock -> General Rock genre, which are between 8 and 15 seconds long. I needed this for a short on-screen presentation / intro screen. Not many tracks are created to be only between 8 and 15 seconds long, but many of our composers create “Stinger” versions of their tracks, which often happen to be between 8 and 15 seconds, so in this case I get a result of 358 tracks. In this case, the resulting track listing doesn’t show me the full length tracks – it shows me only the stinger versions that are between 8 and 15 seconds. My friends, these are only a few examples of how you can use our Advanced Browse page to experiment with our catalog of stock music / royalty-free music and find exactly the tracks you need, with an amazing degree of flexibility and power in your searches. Experiment with it. Have fun with it. You can’t break anything — we hope! 🙂 You may find some combinations give you zero results, and you may find some combinations that give you too many results to make sense of it. If that happens, go back to the form and think of ways to tweak your settings to make your search more open, or more precise. 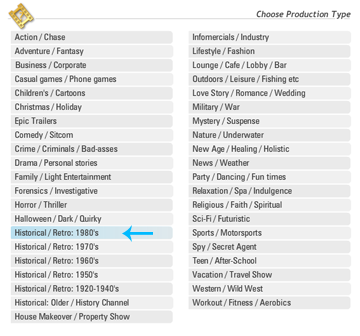 In particular, keep track of those AND / OR buttons and click on them to change their functionality.